The upcoming February 2014 elections, however, will be the make-or-break factor in determining whether this case is just a blip in Salvadoran history or whether this truly signals a rupture with previous institutionalized misuse of public funds. Under an ARENA or a Unidad government, unfortunately, the latter scenario is highly unlikely. Monseñor Romero Boulevard stretches 8.4 km between San Salvador and Santa Tecla, cutting what was once a half-hour or more commute between these two neighboring municipalities, which make up a large part of El Salvador’s capital city sprawl, down to ten minutes. It is equipped with a modern motion-sensor lighting system— he first of its kind in Central America—and controlled entry and exit points. Driving down the white concrete road at night and peering over the high walls on either side you could almost imagine yourself on a minimally populated stretch of freeway in the Hollywood Hills from the twinkling city lights strung across the lush mountain landscape. The Monseñor Romero Boulevard, now a symbol of progress and modernity for President Mauricio Funes, however, was until quite recently the very embodiment of corruption under decades of right-wing misrule and pointed negligence in El Salvador. 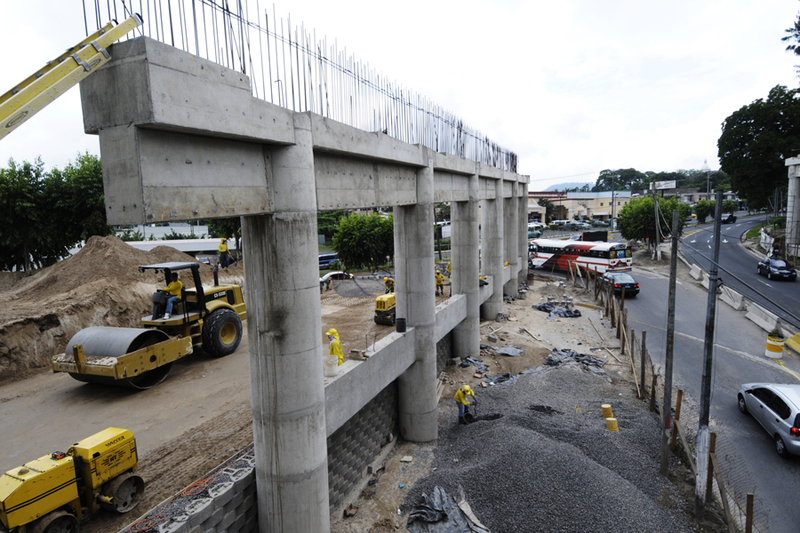 Originally known as the Diego de Holguín Boulevard, after a Spanish conquistador and San Salvador’s first mayor, the project broke ground December 2005, and was originally projected to cost $25.6 million to complete. Almost seven years later, in November 2012, the freeway now renamed Monseñor Romero after San Salvador’s celebrated liberation theology archbishop assassinated in 1980, was finally inaugurated at close to four times its original projected cost—a total estimated $93 million dollars. It was no secret to most Salvadorans while construction was under way on the Diego de Holguín that large sums of money were disappearing into politicians’ and businessmen’s pockets given the constant and numerous irregularities in the project: inexplicable changes in the highway’s route; sudden, lengthy pauses in construction; illegal tree-cutting; and multiple lawsuits. However, it was not until 2010 that the parameters of this elaborate corruption scheme began to be outlined in a suit submitted to the attorney general’s office by the new Minister of Public Works, Gerson Martínez. Martínez, a founder of the leftist Farabundo Martí National Liberation Front (FMLN) party, came to office under President Mauricio Funes’ administration in 2009, becoming the first non- right wing government in El Salvador’s history. In large part, Funes’ electoral victory can be attributed to earnest campaign promises to increase governmental transparency and on his tough-on-corruption stance. Martínez took this message to heart and ran with it upon entering office, initiating the most well documented corruption investigation in recent Salvadoran history involving some of the country’s biggest players. To date,18 people, among them former ministers, vice-ministers, government functionaries, and high-profile businessmen, have been charged in a move that illuminates just whose interests the various political parties running for office in the February 2014 elections have at heart. Whether Copreca-Linares’ credentials made it through thanks to bureaucratic negligence or an intentional overlooking remains unclear. However, the minister of the MOP at the time, David Gutierrez, seemed so secure with Copreca-Linares taking the helm of the project that he gave the company a 30 percent (Gutierrez asserts 25 percent) down payment as an advance for them to begin construction; a legal but highly unusual move considering the nature of their turnkey project. In essence, a turnkey project would have the government resting easy knowing that Copreca-Linares had agreed to assume all financial risks short of natural disaster associated with the project in exchange for a higher-than-usual price tag. Therefore, the 30 percent down payment translated to a whopping $7.6 million handed to Copreca-Linares from the outset. Of that amount, only $1 million was ever accounted for. The rest was used by Copreca to pay off its previous debts. Despite this, construction on the Diego de Holguín entered its second phase in mid-2006 to the anxious anticipation of thousands of capital-dwellers, who often had to wait in seemingly interminable lines of traffic during their daily commute to Santa Tecla. But the benefits were so loudly trumpeted that they surely seemed worth the headache. The project, it was said, would serve 50,000 vehicles per day, and would severely alleviate traffic along the often-in-need-of-repair Jerusalén Highway, the only direct freeway between the two municipalities at the time. Surely they (and I, since as a frequent emigrated retournee, would often find myself stuck in that interminable traffic as well) could hold on for another year of construction? Nevertheless, the problems were only beginning, and it wasn’t long before the general populace began to take notice of these longer than usual delays in construction. In December 2006, David Gutierrez stepped down from his position citing health problems. Shortly before his departure, however, Hugo Barrera, then-Minister of the Environment, couldn’t help but notice that the highway’s original planned route had been altered. Copreca-Linares, it appeared, was now clearing swaths of a protected forest, Finca El Espino, without making any move to obtain the necessary permits to do so. It is now believed that several of those accused in the corruption scandal lined their pockets with money from the sale of these illegally felled trees. San Salvador’s mayor’s office took notice of the unpermitted deforestation as well, and put an injunction against the company to halt construction on the project. On its end, the Ministry of the Environment sued the MOP for environmental damages, a lawsuit which Jorge Nieto, the new minister of the MOP, inherited in January 2007. With these irregularities and two government institutions already pointing fingers at the project, Nieto, a former businessman appointed to the Ministry by Tony Saca, could have chosen to end the contract with Copreca-Linares as his first act as minister. By doing so, the MOP would have received its initial deposit back and another company could have been found to replace Copreca-Linares. Instead, Minister Jorge Nieto chose to extend their contract until October 2007, at which time the highway was to be finished. Nieto also proceeded to submit a countersuit against the Ministry of the Environment for damages in construction delays for not having issued the necessary permits in the first place. Unsurprisingly, the MOP won the lawsuit, and another $158,147—the very same amount of money the Ministry of the Environment had been asking of the MOP—disappeared into the project. It was later revealed that Copreca-Linares had never made a single move to obtain the necessary permits, and it is believed that Jorge Nieto knew this fact full well. Nieto and Hernández Campollo, it seemed, understood from the beginning that there was a good deal of money to be made from the Diego de Holguín, and as time went on, began meeting secretly, planning bold moves to get as much out of the project as they possibly could. After the suit with the Ministry of the Environment, Hernández Campollo dropped Linares from the project, again, against contract. In turn, Linares, who it seems was excluded from some of the juicier scheming, prohibited Hernández Campollo from using the services of the partnership’s lawyer. Now with fewer workers and undoubtedly, due to his bigger plans with Nieto, with less motivation to continue construction, Hernández Campollo’s work on the project ground almost to a halt. Exposed iron rods were left irreparably rusted by the elements, wide, unpaved dirt “exits” disappeared into the bushes, huge piles of gravel and stone became dwarfed by lanky weeds, and half-completed overpasses loomed untouched over traffic, monuments to a project which never had the chance to reach its full potential. Undeterred by the project’s obvious signs of abandonment, Nieto deemed this the perfect opportunity to alter the MOP’s contract with Copreca-Linares. When before disputes between the two parties were to be settled in court, the contract was changed so that disputes had to be settled through third-party arbitration. Shortly after the alteration, the inevitable lawsuit emerged. Nieto interceded between an estranged Hernández Campollo and his former partner, Linares, so that the two could once again make use of the partnership’s lawyer, and reunited, Copreca-Linares submitted a lawsuit against the MOP for loss of profits. The reason? Through the MOP’s negligence in changing the route of the highway and in not obtaining the necessary permits to do so it had become impossible for the company to continue with work. It remains unclear how much of the settlement Nieto stood to gain from the lawsuit, but he seemed so gung-ho about it that beyond acting as mediator between the two companies so they could have access to their lawyer, he even allowed them use of the MOP’s facilities to plan out their case. When the first arrests in the corruption investigation initiated by Martínez began in September of this year, it appeared as though the decision to alter the contract was made because arbitration had a reputation for defaulting against governmental bodies. Recently, however, credible allegations from lawyers formerly employed at the attorney general’s office have emerged stating that this underhanded move could have gone as far as involving the attorney general himself. Félix Garrid Safie, attorney general from 2006 to 2009, removed a committed and critical attorney from the case without warning for wishing to pursue a defense for the MOP that ruled the suit inadmissible in arbitration because the very nature of the contract forbid it. First of all, arbitration should never have been permissible as a way of mediating a dispute between the company and the MOP. Second, and more importantly, Copreca-Linares had agreed to assume all financial risks involved in the project short of extenuating circumstances such as war or natural disaster. This lawsuit surely did not fall into that category, reasoned the attorney, Ana Cecilia Galindo Santamaría. Nevertheless, Garrid Safie warned her not to use that line of defense, and when Galindo attempted to argue, was summarily removed from the defense team. In other words, both the prosecution and the defense were in agreement from the start that the MOP should lose. By the middle of 2008, $8.3 million in damages had been awarded to Copreca-Linares by the state through the arbitration settlement and construction on the Diego de Holguín, a year after its scheduled completion date, had stopped completely. So ends the story of how $10 million was directly embezzled from the Diego de Holguín project to line the pockets of upper-level Ministry of Public Works functionaries and an ambitious Guatemalan businessman. However, much more was certainly skimmed off the top, plucked here and there, over the four years the Diego de Holguín was administered under Tony Saca’s government. In addition to an elaborate money laundering scheme, the attorney general’s investigation on the matter found receipts for purchases by the MOP which were never made, and double-payments on items, such as large amounts of cement, which had only been purchased once. Thanks to unbridled greed and mismanagement, the completed highway ended up costing the Salvadoran state almost four times what it had originally estimated. However, this episode will need to be revisited again and again in the coming months as more details on the extensive corruption scandal continue to emerge. So far, eighteen people have been charged with crimes ranging from embezzlement of public funds, money laundering, elaborating false documents, and influence peddling to deforestation and tax evasion. Of these suspects, several are nowhere to be found, notably Jorge Nieto and Jesús Hernández Campollo, and both David Gutierrez and Félix Garrid Safie are likely not going to be prosecuted as a result of insufficient physical evidence, according to the attorney general’s office. This public airing of the Saca government’s dirty laundry has proven to be highly embarrassing for him, especially since the arrests began just a month before the kickoff to campaign season. Saca is once again running for president, though this time as the candidate for a right-wing coalition party, Unidad. This is by far one of the most extensive corruption cases in Salvadoran history, and likely the only one to have ever taken legal action against such high-level functionaries. Saca himself has been linked to the scandal by Hugo Barrera, the former Minister of the Environment, who claimed in a televised interview that David Gutierrez confided in him in 2006 that he’d been given orders by Saca to give him $40 million from the project. Gutierrez and Saca are both currently suing Barrera for libel, though Barrera says he will not retract his statement. A series of Wikileaks cables from the U.S. embassy in El Salvador paint a portrait of Saca that seems to corroborate Barrera’s statements: a man committed to maintaining good relations with the U.S., but with a reputation for “shameless corruption” both within his own party and with his business partners. One of the cables even implies that Saca’s greed may have been a driving factor in his expulsion from the ARENA party. Popular opinion suggests that the attorney general may simply be out to make a name for himself through the Diego de Holguín case, netting all the big fish he can haul in before he leaves office, or that the Funes’ government is proceeding full steam ahead with corruption prosecution as a political move to exit the presidency in style and secure more votes for the FMLN in the upcoming February 2014 elections. Besides going after Antonio Saca’s administration, Funes is now calling for former President Francisco Flores (1999-2004) to be investigated on corruption charges as well—a move which has earned him threats from within the ARENA party. However, as flashy as the Diego de Holguín case may be, there seems to be genuine determination on the part of the government and the attorney general’s office to bring the culprits to justice. For one, the attorney general has asked Interpol to issue a capture order against Nieto, rather than allowing him to live out his days in freedom in Miami, as has too often been the case for powerful Salvadorans fleeing justice in the past. Hopefully, the Funes government has set the standard infinitely higher for future Salvadoran governments in corruption prosecution and has made the right-wing oligarchy less secure in continuing with these insidious practices of rampant corruption. The upcoming February 2014 elections, however, will be the make-or-break factor in determining whether this case is just a blip in Salvadoran history or whether this truly signals a rupture with previous institutionalized misuse of public funds. Under an ARENA or a Unidad government, unfortunately, the latter scenario is highly unlikely. Allison Ramírez is a Committee in Solidarity with the People of El Salvador (CISPES) activist and Salvadoran-American who divides her time as equally as possible between both countries. She would like to thank www.elfaro.net for their extensive coverage of the issue which made the writing of this article possible. To learn more about CISPES or to join us for the February 2014 elections observation delegation in El Salvador, visit www.cispes.org.